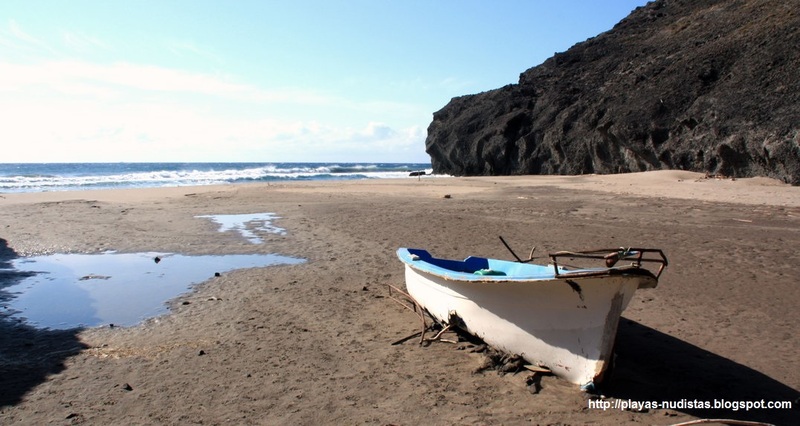 Only accessible after a long, narrow and even dangerous path, this is one of the most isolated beaches in Cabo de Gata. An old wrecked boat is the only sign of human presence in this sunny paradise. By car, you must follow the instructions to the beaches south of San Jose, following the unpaved road for 4km. In summertime, you have to pay to park (5€), and these places get full early in the morning. At that moment the road is closed at San Jose. A bus connects then the town with the main three beaches. If you park at Los Genoveses car park, walk to the right end of this beach and continue along the path that takes you to the other side of Los Genoveses point, next to Cala de los Amarillos beach. The path goes up and down following the edge of the cliffs. Not an easy way, and even danerous at certain points. After some mintues walking, you reach Cala del Principe. Another possibility, may be easier but undoubtely less interesting, is to continue to Barronal beach car park, walk back along the unpaved road (remember, you can only park in the designated areas) and find your way across the naked land to the shore. The sand occupies the bottom of a ravine creating a triangle-shaped beach approximately 100 m long and 100 m wide. The beach is in an absolutely virgin area. You have to take everything with you, and don't forget to bring plenty of water. You will probably be alone on this beach. You can do whatever you want. And don't worry if someone appears. In Cabo de Gata nudism is tolerated on every single beach (except perhaps the urban ones). Hidden beach in a virgin area.